Do you know how to recognize the signs of decay or what it would take to repair or restore the log home to it’s original beauty? 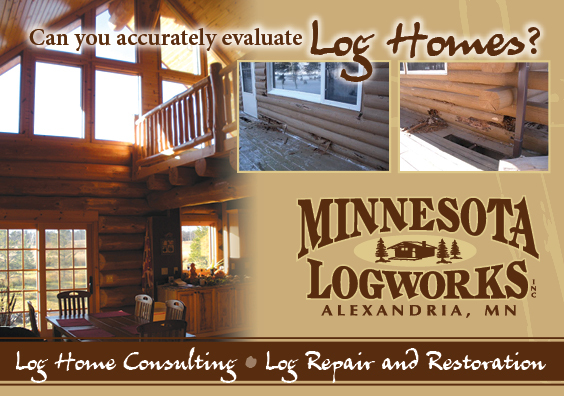 The average buyer or seller of a log home in Minnesota likely will not be provided an accurate evaluation of the condition of the home. Many home inspectors simply aren’t qualifed to evaluate log structures, they are much more experienced with conventional home inspections. Sometimes signs of decay are obvious (i.e. crumbling logs) but more often, they require a trained eye to notice. I will point out any warning signs, including rotted logs, stain or finish that does not allow water to “bead”, indications of water damage to interior walls, and log home design elements that may be promoting the decay. For a minimum fee, I will meet you on site and evaluate the overall condition of the log home. A complete visual inspection of both the exterior and interior of the log structure will be made, including the foundation, floor trusses, purlins, log ends and all window and door openings. I evaluate the checking of the logs and the chinking material. I will also inspect for gaps, identifying any type of water infiltration that can or has already lead to log decay or mold growth. You will receive a complete inspection report, including any areas of mold, water infiltration, moisture collection or insect infestation along with any recommendations for caulking, staining, sealing maintenance work and/or log repair and restoration work.